Running With Friends is the new Temple Run like game from Zynga, the creators of Words With Friends, FarmVille and many other social games. It’s available for iOS, and compatible with iPhone, iPad and iPod Touch. 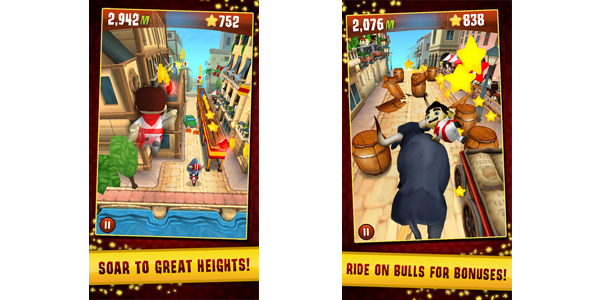 The game is based on the famous Spanish Running of the Bulls festival of San Fermin. The goal, like all endless runner games, you have to run a course, collecting stars and avoiding obstacles. 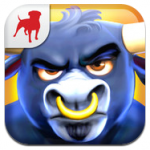 In Running With Friends you are being chased by bulls, and Zynga have created a festival where the police have set up road blocks along the course, apparently to help the bulls catch the runners. The game has been confirmed for Android, but there is no date yet. Zynga has been playing catch up in the world of mobile games, since its pioneering Facebook games like Farmville. The company has been focusing on its ‘Friends’ games recently, which typically take a popular mobile genre, and add Zynga’s social layers. Running With Friends is free to play, but also includes premium content which can help you perform better in the game. In app purchases range from $0.99, to an impressive but not unheard of $99.99.